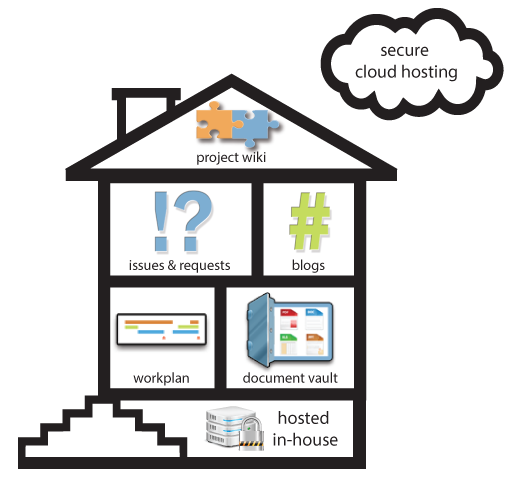 Project.net can be either hosted in-house or securely hosted on the web — your choice. Secure web-based hosting makes it easily accessible by geographically remote team members or external contractors while avoiding internal IT hassles and overhead. Many of our customers enjoy the benefits of web-based hosting, or SaaS, but it doesn't work for everybody. Some customers need to host their own project management solution, including those operating in regulated industries and situations where security is a primary concern. Customers whose systems are highly customized may benefit from hosting their system in-house as well. Customer needs also change over time; you may start out with a simple SaaS solution, but require the ability to host some projects in house as your use of the software expands. At Project.net, we believe it's important to provide hosting options that meet a range of customer needs and continue to meet those needs as they evolve.